The Environmental Protection Agency is proceeding “full steam ahead” with the closure of an office in Las Vegas this year, but employees remain confused about whether the closure will be allowed under language in the recently enacted omnibus spending package. EPA has sent “management directed reassignment” letters to more than 40 employees at an Office of Research and Development laboratory notifying them to either accept a position at an office in another part of the country or risk being “separated from the federal service” by Sept. 30. More than a dozen human resources employees located across the street from the ORD lab are also facing a mandatory relocation. A recent spending bill signed into law by President Trump last month has led to widespread confusion among the roughly 60 workers, as the measure included language from Congress directing EPA not to close any regional offices or engage in any large-scale workforce reshaping. 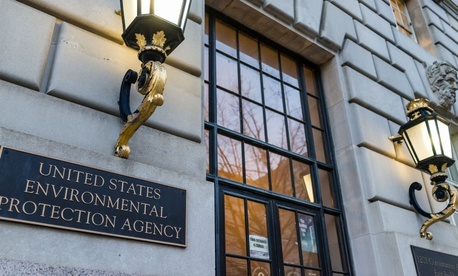 According to one staffer who has spent decades at EPA, employees are now being told the deadline could be accelerated to accommodate an expiring lease in the office that houses the HR employees. ORD workers in Las Vegas were originally told they would have until 2020 before their lab closed, but EPA management suddenly revised that schedule earlier this year. Employees have since been told they will face a deadline to move at some point over the summer, but agency leadership has not been forthcoming with details. Appropriators said in an explanatory statement accompanying the recently passed omnibus spending bill that they did not expect EPA would “consolidate or close any regional offices in fiscal year 2018.” They also seemed to prevent the agency from laying off any employees, saying EPA would not "undertake large-scale adverse personnel actions or incentive programs in fiscal year 2018." The lawmakers specifically said they were not providing any funds for workforce reshaping. EPA, however, offered to cover relocation expenses including transportation costs and per diems for employees and immediate family members, general moving costs, lease termination costs, selling or buying transaction costs, temporary storage of household items, relocation income tax allowance and up to 60 days of temporary housing. Additionally, if EPA decides to follow through on laying off employees who opt not to accept their reassignment, those workers would be eligible for up to one year’s salary as severance pay. It appears EPA is circumventing that congressional guidance because the Las Vegas office is a lab and not a regional post. When managers first announced the mandatory reassignments, they said the agency had leftover funds it was appropriated in fiscal 2017 for relocation benefits and separation payments, an employee at the lab told Government Executive. Still, EPA risks flouting congressional intent. A spokesman for Democrats on the House Energy and Commerce Committee previously said it was his office’s understanding that the omnibus would have prevented the closure of the Las Vegas office. Appropriators this week questioned Office of Management and Budget Director Mick Mulvaney on the Federal Labor Relations Authority's planned closure of two offices, citing similar language in the omnibus covering that agency. EPA did not respond to inquiries into whether it would scrap the closure, how it could move forward, or how it would pay for relocation and severance costs, given the language accompanying the spending law. “The omnibus hasn’t stopped a thing,” said one Las Vegas employee, who estimated that only a few employees so far have accepted positions at a new location. The uncertainty, the employee added, has been the worst part of the process. “I have no problem if they have a sound business case to shut down a facility,” the career EPA worker said. To date, management has not made that available. Ann Pitchford, another employee in Las Vegas, said she has decided to retire. She began working at EPA during her sophomore year in college and has remained at the agency for 43 years. She planned to stay for several more years before the office closure was announced. She considered moving, but decided against losing time with her grandchildren. "People are upset," said Pitchford, a senior scientist and principal investigator with a master's degree in physics and a doctorate in civil engineering. "We're losing people and certain work is not going to get done." Employees who are relocating have yet to be told what their new assignments will be, but are hoping to receive an update shortly. Others are waiting to see if the rumored buyouts will be approved, which Pitchford said would require those who accept the offer to leave the agency by June 30. Other EPA labs around the country may also face closure or consolidation, the agency said last year, though those do not appear to be scheduled to occur in 2018. Steven Calder, president of the American Federation of Government Employees local that represents agency employees in Massachusetts, said employees at EPA’s New England Regional Laboratory in Chelmsford, Mass., have been told their post will be moved in 2020. The most likely outcome, he said, according to what management has told employees, is EPA will not close the lab altogether but move it to a building the agency owns in Narragansett, R.I. That would require a two-hour drive plus whatever rush hour traffic comes with navigating both Boston and Providence, R.I., Calder said, meaning employees would also most likely face the choice of either relocating or separating from the agency. Again, EPA management has not provided employees with a clear update.